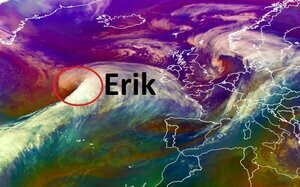 Location of #StormErik as it begins to rapidly develop in the Atlantic. A Status Yellow warning is in operation for Ireland from 5am Friday to 6am Saturday. For a shorter period, Status Orange warnings are in operation for counties Galway, Mayo and Donegal. Winds will be most severe in Atlantic coastal areas where there will be dangerous sea conditions. The combination of low pressure, high seas and high tides will lead to localised coastal flooding. The Status Orange warning is in operation for Galway and Mayo from 5am to 1pm Friday and for Donegal from 9am Friday to 6am Saturday. Posted in Misc and tagged Storm Erik at 1:41 pm on February 7, 2019 by Bodger. There’s great drying out today though. 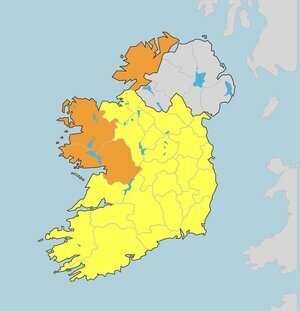 Strange how the Orange part is highlighted for Galway, Mayo and Donegal, but is completely missing Sligo and Leitirm.